Born March 30, 1746 – Died April 16, 1828. Spanish painter applauded in art history as the transition personality between the Old Masters and modern art. 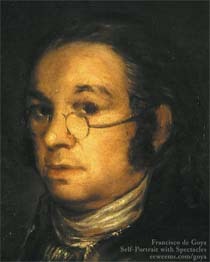 Court painter to the Spanish Crown, Goya pursued personal projects in paint, drawings and etchings in which he chronicled national historical events and carefully articulated a critique of Spanish, and then European ideals, society, morales and religious institutions. "From this headlong seizure of life we should not expect a calm and refined art, nor a reflective one. Yet Goya was morethan a Nietzschean egoist riding roughshod over the world to assert his supermanhood. He was receptive to all shades of feeling, and it was his extreme sensitivity as well as his muscular temerity that actuated his assaults on the outrageous society of Spain." From Thomas Craven's essay on Goya from MEN OF ART (1931). "...Loneliness has its limits, for Goya was not a prophet but a painter. If he had not been a painter his attitude to life would have found expression only in preaching or suicide." From Andre Malroux's essay in SATURN: AN ESSAY ON GOYA (1957). "Goya is always a great artist, often a frightening one...light and shade play upon atrocious horrors." From Charles Baudelaire's essay on Goya from CURIOSITES ESTRANGERS (1842). "[An] extraordinary mingling of hatred and compassion, despair and sardonic humour, realism and fantasy." From the foreword by Aldous Huxley to THE COMPLETE ETCHINGS OF GOYA (1962). 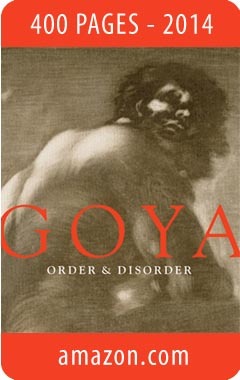 "His analysis in paint, chalk and ink of mass disaster and human frailty pointed to someone obsessed with the chaos of existence..." From the book on Goya by Sarah Symmons (1998). "I cannot forgive you for admiring Goya...I find nothing in the least pleasing about his paintings or his etchings..." From a letter to (spanish) Duchess Colonna from the French writer Prosper Merimee (1869).